Where does your water comes from? 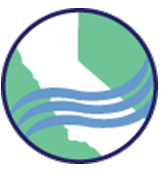 The primary sources of water supply for communities along the north coast and the upper Sacramento Valley are from reservoirs, streams and groundwater. Some water is from the State Water Project. 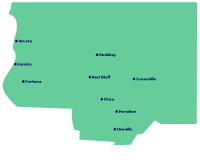 The Chico‐Hamilton City District of the California Water Service (Cal Water) is the sole water service agency in Chico. 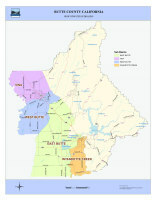 Cal Water operates 62 groundwater wells in Chico and has 27,775 water service connections. Red Bluff operates 14 wells, varying in depth and capacity as has two 3 million gallon water storage facilities. Oroville has several water suppliers one of which is from California Water Service. Paradise’s main water source is Paradise Lake and is operated by Paradise Irrigation District which serves ~10,438 municipal, residential and commercial customers. Oroville has several water supplies, one of which is from Lake Oroville and is operated by the South Feather Water & Power District as well as California Water Service; another source is from Concow Reservoir (Wilneor Reservoir) via Thermalito Water and Sewer District. The State Water Project begins at Oroville Dam on the Feather River and ends at Lake Perris near Riverside, CA in southern California. Water from the Feather River travels over 700 miles through open aqueducts and pipelines before reaching Southern California. Oroville's supply of water from the State Water Project is from Lake Oroville and operated by the South Feather Water & Power District. Rainwater is FREE fresh water that can be utilized to offset the consumption of our freshwater supplies. By harvesting rainwater, we can put it to good use. Captured rainwater can be used for crops, greenhouses, livestock and irrigating landscape. Or it can be used indoors for flushing toilets and washing laundry, within the boundaries of California laws. Water Code section 10574 provides that rainwater harvesting for nonpotable use (not for drinking) does not require a water right permit. The State Water Board encourages methods of water collection or diversion, such as rooftop rainwater harvesting, that reduce demand on surface and groundwater supplies and reduce water quality problems associated with stormwater runoff. We install rainwater harvesting systems! Visit our RAINWATER page for more information. Contrary to popular opinion, groundwater does not exist in underground lakes. Groundwater fills pores between sand, gravel, silt and clay in water-bearing formations known as aquifers. The upper surface of groundwater is called the water table and is free to rise and decline. Alluvial aquifers, most common in the Sacramento Valley region, are generally very permeable and provide large quantities of water to wells. Wells are drilled to reach the groundwater supply and may be shallow just below the water table or deep into the aquifer itself. An aquifer is a body or formation of rock or sediment that yields significant amounts of groundwater to wells or springs. The Tuscan aquifer (comprised of the Lower and Upper) is one of the regional aquifer systems of the Sacramento Valley. It is the principal water bearing aquifer in Butte County. 1 While little is still understood about this formation there is significant monitoring and research happening to gauge both a better understanding of the aquifer system itself and how human use is afffecting it. A groundwater basin is an “ . . . aquifer or stacked series of aquifers with reasonably well-defined boundaries in a lateral direction, based on features that significantly impede groundwater flow, and a definable bottom . . . ”. Lateral boundaries are features such as rock or sediments with very low permeability or a geologic structure such as a fault. Bottom boundaries would include rock or sediments of very low permeability if no aquifers occur below those sediments within the basin. In some cases, such as in the Sacramento Valley, the base of fresh water is considered the bottom of the groundwater basin. Cal Water Chico pumps groundwater from the Tuscan aquifer and in 2015 alone CalWater pumped 18,227 acre feet of groundwater to supply residential, commercial, industrial and governmental customers. 1 To put this in perspective, just 1-acre foot of water equals about 326,000 gallons, or enough water to cover 1-acre of land 1-foot deep. In gallons of water this equals almost 6 BILLION GALLONS OF GROUNDWATER (5,939,293,988.57) IN ONE YEAR! This figure does not account for residents who are not supplied by Cal Water Chico and obtain their water through private wells. Agricultural water demand is also met through private wells. Where does your water go after the drain? Mor often than not if you live in a city when wastewater flushed from your toilet or drained from your household sinks, washing machine, or dishwasher leaves your home, it flows through your community's sanitary sewer system to a municipal treatment facility. In rural areas people generally have a septic tank system to treat household wastewater. 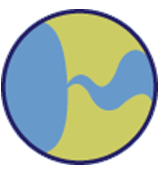 The discharge location for treated wastewater (effluent) is the Sacramento River. The WPCP operates a 1.1 Megawatt, Solar Photovoltaic facility providing electric power to the WPCP. A 335-kilowatt co-generator is on site that uses methane produced in the plant process as a fuel source to produce electricity which is used at the WPCP. The discharge location for treated effluent is the Feather River. The City of Oroville owns and operates a sanitary sewer collection system. 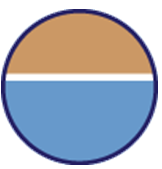 In addition to the City's system, Thermalito Water & Sewer (TWS) and Lake Oroville Area Public Utilities District (LOAPUD) operate a separate sanitary sewer system. The discharge location for treated effluent is the Sacramento River. The treatment plant has a design capacity of 2,500,000 gallons per day and currently treats about 1,400,000 gallons per day in dry weather. The cost PER month to the outsourced operations company is more than $57,000. Septic systems are underground wastewater treatment structures, commonly used in rural areas without centralized sewer systems. They use a combination of nature and proven technology to treat wastewater from household plumbing produced by bathrooms, kitchen drains, and laundry. A typical septic system consists of a septic tank and a drainfield, or soil absorption field. All water runs out of your house from one main drainage pipe into a septic tank. The septic tank digests organic matter and separates floatable matter (e.g., oils and grease) and solids from the wastewater. Soil-based systems discharge the liquid (known as effluent) from the septic tank into a series of perforated pipes buried in a leach field, leaching chambers, or other special units designed to slowly release the effluent into the soil or surface water. The wastewater percolates into the soil, naturally removing harmful coliform bacteria, viruses and nutrients. Greywater is untreated waste water which has not come into contact with toilet waste. Greywater includes waste water from bathtubs, showers, bathroom wash basins, clothes washing machines, and laundry tubs. It does not include waste water from kitchen sinks, dishwashers, or laundry water from soiled diapers. 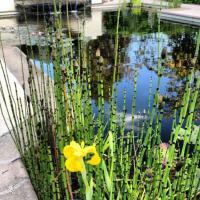 Greywater systems can work in several different ways. The two broad categories for greywater use include indoor reuse and outdoor reuse. 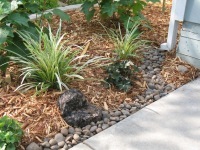 Outdoor greywater is used for watering a landscape. We install greywater systems! Go to our GREYWATER page for more information. 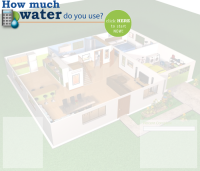 How much water do you use evey day? American's use, on average, twice as much water as people in other countries. Why? Our landscapes are the major consumer of water in the US. People commonly grow plants from cooler, wetter climates (like turf grass for lawns) and have to irrigate them in drier climates, like our Mediterranean climate in the Sacramento Valley. It’s a hard figure to quantify across California, and estimates vary widely. For one, while indoor residential water use is relatively steady throughout the state, outdoor use — primarily for landscape irrigation — varies dramatically, with homes in arid inland regions consuming significantly more water than those in coastal areas. A 2011 study of single-family water consumption, estimated that the average California household used an average of 362 gallons of water per day and more than half was outdoors. The study found that about 53 percent of total average household water use — or more than 190 gallons per household per day (gphd) — was used for landscaping and other outdoor uses. The 2011 study, California Single Family Water Use Efficiency Study, sponsored by CDWR and managed by the Irvine Ranch Water District, logged water consumption in the year 2007 for 735 homes spread across the state’s 10 hydraulic regions. The end uses of water include all places where water is used in the single-family residential setting such as toilets, showers, irrigation, clothes washers, faucets, leaks, dishwashers, baths, evaporative cooling, water treatment systems, water features, swimming pools, hot tubs, etc. 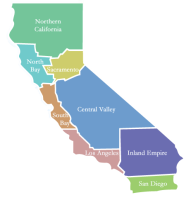 There is a very useful Interactive Map on water use in California by region put together by the Pacific Institute. The features allow users to examine how water use varies within regions, across the state, and over time. Colored zones show a gradient of water use across the state, from green for lower per capita water use to bright red for the highest users. By clicking on each location, users can see graphs of per capita use over time and comparisons to the regional and state averages. 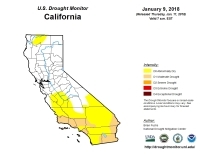 Water use data are updated monthly from reports by the California State Water Resources Control Board, while geographic data are drawn from the California Department of Public Health’s website, supplemented by research from the Pacific Institute. An extended period when a region receives a deficiency in its water supply, whether atmospheric, surface or ground water. 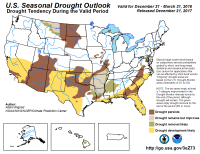 Generally considered a deficiency in precipitation over an extended period, usually a season or more, resulting in a water shortage causing adverse impacts on vegetation, animals, and/or people. During the past more than 1,000 years in the Western United States there were multiple droughts which lasted 10 or 20 years in a row. We know this through the studies of tree rings, sediment and other natural evidence. CALIFORNIA GREW IN SIZE AND POPULATION DURING THE WETTEST PERIOD ON RECORD! What does this mean? It means that every city planned and every decision made in the last 150 years has been based on having a surplus of water! It's more important than ever to create a future that does not require the same inputs of water to thrive. We all need to do our part to conserve water. Whether you utilize municipal or well water it's vital to conserve this precious resource. Check out some the services we offer to help you reduce outdoor water consumption and still ensure your landscape aesthics and function.